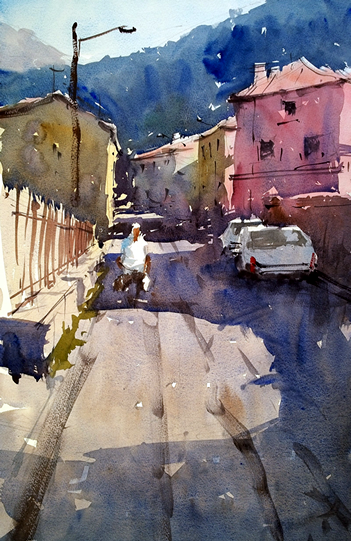 Our first day out and we ease into our painting with a simple scene of the main road in Posara, just up from the Watermill. Now, don't worry, It's a quiet road and we're painting normally on a Sunday so we only have to keep out of the way of the local church goers. So, a simple scene looking down the street and an exercise in perspective and composition, plus deciding whether to go portrait or landscape orientation. This is a quiet little village with narrow streets and dominated by the castle. 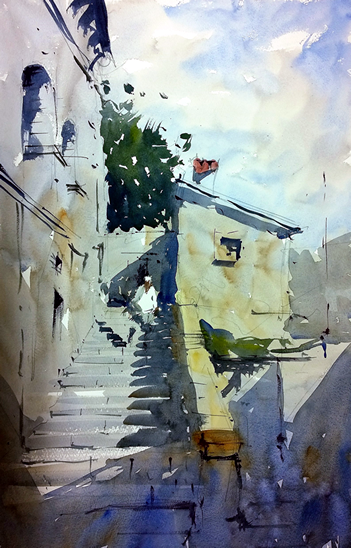 Here I focus on the steps - repetition can work well in the composition and also placement of shadows. And we also try to get figures into our painting to add more interest and a sense of scale. Fivizzano Market Day is Tuesday - the morning offers an open air market spread around the Medici fountain in the centre of town. 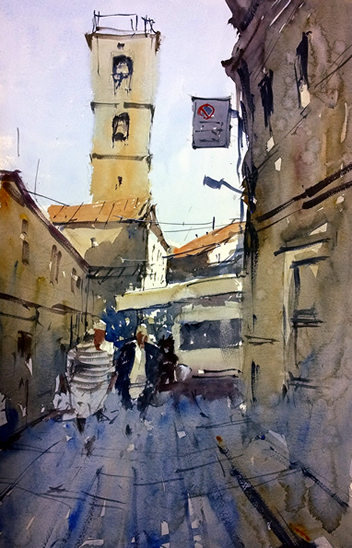 This was a plein air looking up towards the square and the church bell tower. I tend to not overdue the figures' legs if they're in deep shade. Just a hint of them. Our day out visiting the beautiful coastal area of Cinque Terre with five very pretty seaside villages. Now you don't have to paint on this day - relax and do some sightseeing if you want to. I'll be painting as usual and will try and find a relaxing place to position myself with a lovely scene in front of us. So this is Vernazza, looking across the bay to the lovely buildings on the other side, some nice shadows crossing the scene, and some bed linen hanging out to dry. Every day we'll paint outside as much as possible and Tim will try to do two demos during the day. 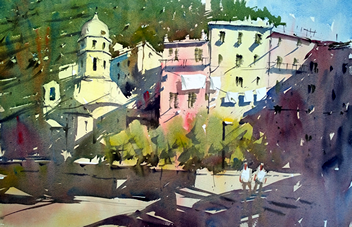 He says: “During the demos I’ll welcome questions, such as ‘Why did you choose that scene?’ ‘What brush are you using there?’ ‘What colour combination did you just use?’ and so on”. After the demonstration, everyone can have a go at replicating that scene. Tim says: “I will be on hand to look over your shoulder and give some words of encouragement and try to give advice on what, in my opinion, does work and what doesn't. We can also have all our work displayed together and go through a brief critique and compare our experiences". “If we're in the studio, no problem. There will be opportunity create some watercolour landscapes from some reference photos and we can do exercises on figure work, and getting things like cars or boats into the landscape.